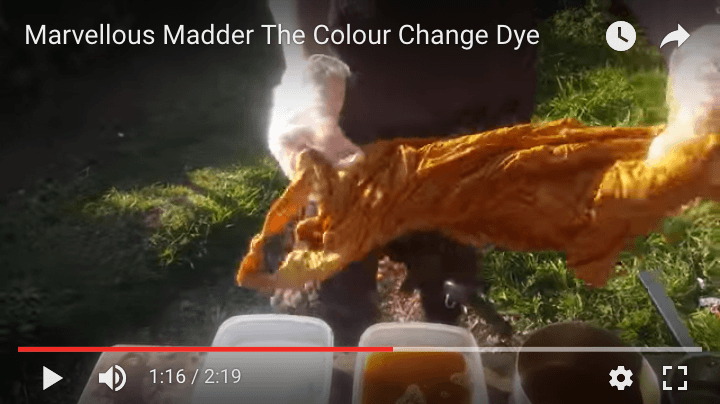 Madder dye and its magnificent colour change! Madder dye is a spectacular colour changer, with our new kit you can watch it go through a colour change when you expose the freshly-dyed fabric to washing powder. You can dye your own cotton bag with natural Madder dye and enjoy watching it change colour! Our new kits contain everything you need to produce a gorgeously dyed cotton bag, including washing powder (although you can use your own). Simple instructions, including How To Do The Colour Change! Watch the unveiling of this madder tie dye project, always an exciting moment! Click here to order your own natural Madder Dye Kit now!